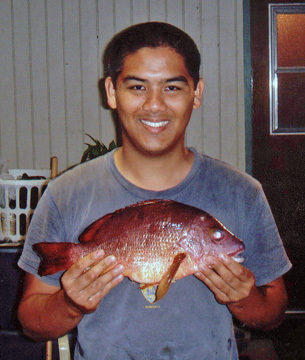 Eleven years after he set the state record for to'au at 4 lbs 2 oz, James Juan broke it again! While shore fishing on the Hamakua Coast of the Big Island of Hawai'i in 30 to 40 feet of water, James caught a 4-lb 8-oz blacktail snapper on his Nitro pole, Shimano Sedona reel, 15-lb test and a squid bait. James established his first to'au record on July 1, 1996.